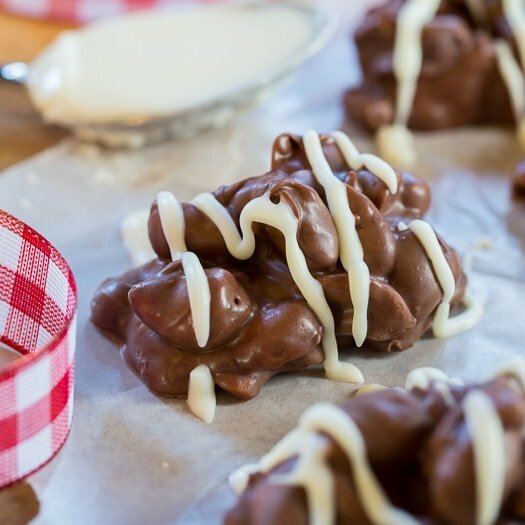 Turn your crock pot into a candy maker with these Crock Pot Nut Clusters. Just a few ingredients and about 5 minutes of prep time is all you need. You can use all peanuts or a mixture of nuts. I used a combination of peanuts and cashews. I was going to use all cashews but then I realized how expensive that would be. Pecans would also be delicious. A couple of hours on LOW in the slow cooker melts the chocolate. Scoop them out with a large spoon or use an ice cream scoop for more uniform clusters. Place them on parchment lined baking sheets and either refrigerate for about 45 minutes or let sit at room temperature for 1 to 2 hours to set. Melt some white chocolate almond bark to drizzle over them to fancy them up some. This recipe makes a large amount – about 2 trays full. They make wonderful gifts for the holidays. Put them in cellophane bags and tie with ribbon to make them look festive. 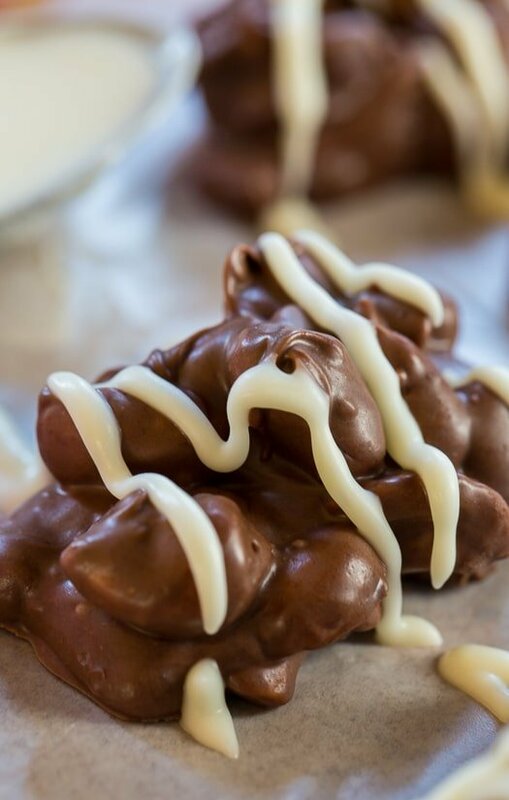 You won’t find an easier candy recipe than Crock Pot Nut Clusters. Next to Buckeye Balls, they’re my favorite candy to make for Christmas. Watch the short video below to see how easy it is to make this recipe! Combine all ingredients in a large crock pot, EXCEPT the 8 ounces white chocolate almond bark. Cover and turn to LOW. Cook for 2 hours, stirring halfway through. Line two baking sheets with parchment paper or wax paper. Use a large spoon or ice cream scoop to scoop mixture onto parchment paper. Place in refrigerator to set or leave at room temperature for about 2 hours. Place the 8 ounces of white chocolate almond bark in a microwave safe bowl. Microwave on HIGH at 30 second increments, stirring in between until melted. Let cool slightly and place in a plastic bag. Snip the corner of the bag and drizzle over nut clusters. Sharing with The Weekend Potluck at The Country Cook. Like making desserts in your crockpot? Try this Crock Pot Pecan Pie! This entry was posted in Desserts, Other Desserts and tagged candy, chocolate, nuts, peanuts. Bookmark the permalink. I prefer using honey roasted peanuts. I have made these before but have added 1 cup of dried cranberries to the nuts. hat sounds marvelous Nancy and perfectly festive for Christmas!! I’ve done something like this for at least 3 years in a row. The only difference is, all peanuts, no white chocolate, plus half a bag or so of mini marshmallows. Add the marshmallows at the end, slowly stir until they’re covered in chocolate, keep on stirring until they just barely start to melt. Rocky road clusters! I making these right now…I’ll let you know how they turn out. I’m using cocktail peanuts instead of dry-roasted…I hope they’ll be good. Hope you enjoy them! I think cocktail peanuts will work well. Anyone ever try macadamia nuts?????????????????? Oh my gosh, I love this idea! I’ve never tried making candy in the crockpot and can’t wait to try it! They look amazing!!! In the crock pot? Really? Incredible! They look amazing!!! I make these but put them in the small muffin papers for Christmas. Very festive! Yummy too! Love that! Turns them into a great gift! You make candy in your slow cooker?! What don’t you do, Christin? Can I rent a closet in your house? I promise to be super quiet as long as you feed me! These nut clusters look fabulous! This is so cool, Christin! Making any kind of candy always feels amazing and to do it like this with the crockpot is such an easy, fun idea. I know these are addictingly good. These clusters look incredible girl! Yes amazing! Oh my goodness—-these are simply amazing. Too easy. They look like the real meal deal too. Thank you! Christin, you are too much! 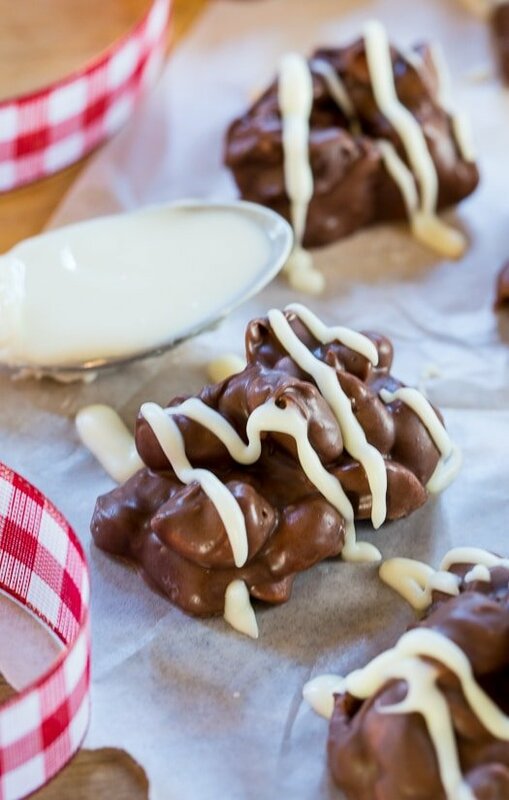 I love that you used your crock pot to make these clusters, Christin! What a creative idea! They look delicious and would make a perfect gift, too. Pinned! I’ve never thought to use my crockpot for this type of recipe! I love it! And I like that this makes a big batch – so I can keep some for myself and give some away 🙂 Have a great weekend!